Washington, D.C. –The Department of Homeland Security has proposed regulations that would penalize low-income immigrants, who receive or who are “likely to receive” public benefits, such as health, housing, and food assistance, that are critical to ensuring they enroll and succeed in higher education. Under the proposed rule, which substantially expands the definition of “public charge,” legally authorized immigrants who access basic nutrition, housing, and health programs, could jeopardize their chances of obtaining green cards or restrict any future opportunities to change or upgrade their immigration status. As researchers have shown, these proposed regulations will produce fear and confusion as lawful immigrants decide to forego enrollment for themselves and their families in these programs out of fear of harming their future eligibility to stay permanently in this country. Read more. The Community College Consortium for Immigrant Education and the Presidents’ Alliance for Higher Education and Immigration submitted comments to the Department of Homeland Security to express our opposition to this proposed “Public Charge” rule. The comments outlined our top 10 ten concerns. This higher ed template was developed by CCCIE and the Presidents’ Alliance, collaboration with the Center for Law and Social Policy and with input from the National Skills Coalition. Institutions and individuals can use this template to submit and modify their own comments. 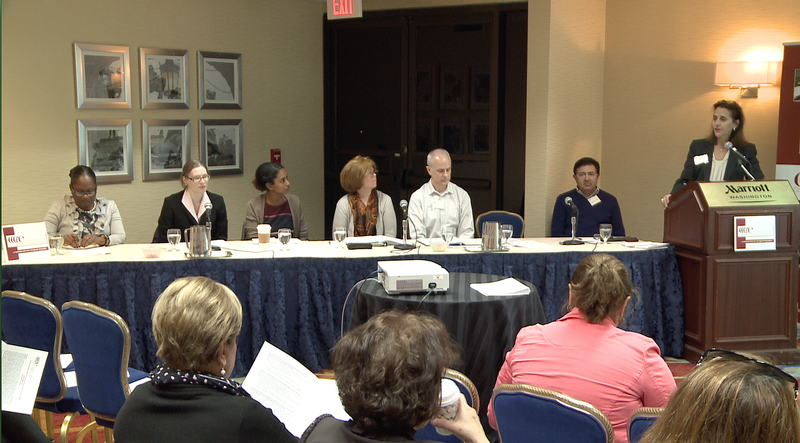 CCCIE convened a diverse group of stakeholders in Washington, D.C.—including community college administrators and faculty, CBOs, researchers, funders, policy experts, and government officials—to discuss findings from its National Survey on Increasing Opportunities for New Americans at Community Colleges and explore the steps colleges and their partners can take to advance college completion, career readiness, and the full integration of immigrant and refugee students into American society. Guatam Ramchandani, CEO of GlobalSource, presented the survey results and Teresita Wisell, CCCIE Executive Director and Vice President, Continuing Education and Workforce Development at Westchester Community College, moderated the panel discussion. CCCIE’s first-of-its-kind national survey, which was launched in March 2015, collected input from 160 community college respondents in 33 states that, taken together, account for well over 80% of the nation’s foreign-born residents. Respondents included a cross section of college staff, including presidents, vice presidents, deans, ESL and other faculty, program directors, as well as staff from workforce development and student services. While more than one-third of the respondents said their colleges include explicit references to support of immigrant students in their strategic or high-level plans, the survey found a wide variability in actual programs implemented on the ground. The survey sheds light on the areas most colleges are currently investing in to address immigrant students’ success and also revealed where there are clear gaps in services. For example, while many colleges are investing resources to strengthen ESL instruction and the transition of ABE/ESL students to college programs, as well as other academic support and advising services, respondents reported less success in their colleges’ capacity to prepare immigrant students to meet workforce requirements. A majority of respondents indicated a need for strengthening ties with employers and developing more job-related training and support for immigrants, including contextualized ESL career pathway programs. Respondents also reported limited capacity to track immigrant students’ success through collection of data. 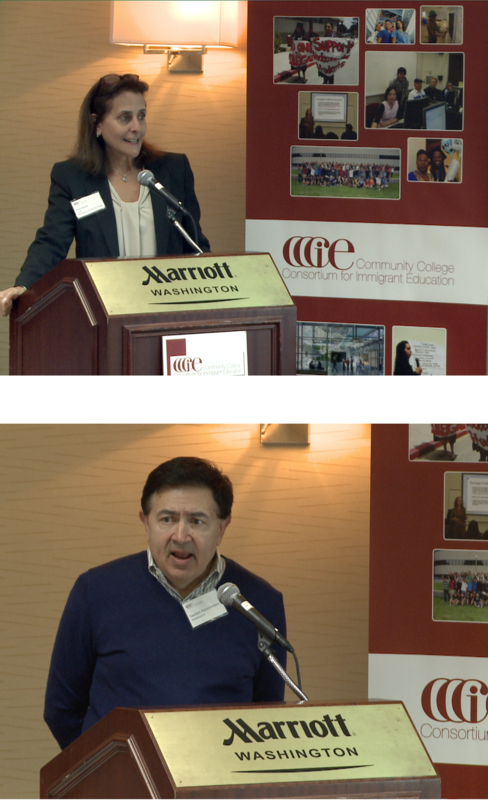 “We conducted this survey to learn more about the challenges and opportunities community colleges face as they serve immigrant students, noted Teresita Wisell, Executive Director of CCCIE and Vice President for Continuing Education and Workforce Development at Westchester Community College, which hosts and supports CCCIE. “It was clear to us that, in many cases, colleges were not focusing on immigrant students as a specific subset, and those that were did not have an opportunity to share their successes, as well as the challenges and obstacles they’ve experienced.” She added that CCCIE intends to leverage the survey results to build communities of practice among colleges to learn from successes and develop additional resources. Among the tools being developed is a Data Metrics Template to help colleges develop common indicators for monitoring the progress of immigrant students toward their education and career goals and designing interventions to accelerate their success. Download the survey summary and slide presentation to learn more about CCCIE’s key findings and recommendations. A distinguished panel of speakers with expertise in immigrant education and workforce development issues reflected on the survey findings and commented on the broader policy and practice implications, including how community colleges and policy makers might use the survey results “as a tool for readiness assessment of WIOA implantation,” said Lul Tesfai, Senior Policy Advisor at the Office of Career, Technical, and Adult Education, U.S. Department of Education. She noted that the survey focuses on many of the areas prioritized in the Workforce Innovation and Opportunities Act legislation, including career pathways and coordination of services across the adult education and workforce training spheres. She urged community colleges to join the workforce development boards involved in planning WIOA services at the local level. Other panelists, including Dr. Malou C. Harrison, President of North Campus at Miami Dade College, and John Hunt, Executive Director for Adult Community Learning at LaGuardia Community College, commented on steps their colleges are taking to serve their growing immigrant student populations. For example, Miami Dade College offers an American Dream College Scholarship for both immigrant students, regardless of status, and native-born students, and provides extensive navigational and advising services for students, starting in high school and extending through the first year of college. Initiatives at LaGuardia Community College include the Welcome Back Center model that serves foreign trained healthcare professionals, the NY-BEST courses pairing basic skills/ESL instruction with technical content, and the First in the World federal project which targets college entry, persistence, and graduation and also looks at how ESL students transition to the credit side of the college. Only half of the students eligible to apply for Deferred Action for Childhood Arrivals, which offers temporary relief from deportation and potential work authorization, have actually done so, said Margie McHugh, Director, National Center on Immigrant Integration Policy, Migration Policy Institute. “This represents a real opportunity for community colleges to reach out to those students who lack a high school diploma and help them transition from the noncredit to the credit side of the college.” She added that DACA students are also authorized to access Title I WIOA Funds. We encourage you to use the survey results to benchmark your colleges’ best practices, and please send us your success stories and challenges in serving your immigrant and refugee student populations. Send to: Jill.Casnerlotto@sunywcc.edu.